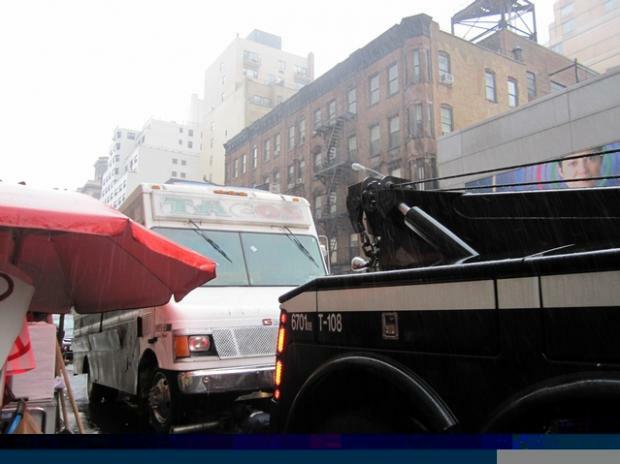 UPPER EAST SIDE — It wasn't the rain that spoiled Paty's Taco Truck's first day back on the Upper East Side. It was the police. The NYPD towed the food truck just after 1 p.m. on Tuesday in the midst of a special $1 taco deal that was meant to commemorate Paty's return to 86th Street and Lexington Avenue. The taco truck, which has built a loyal following on the Upper East Side corner over the last two years, was ousted from the neighborhood more than a month ago, following a ticketing blitz that culminated in the arrest of the taco truck founder’s son, Alberto Loera, and the truck's towing. The battle continued on Tuesday. "They told us we had to move or we'd be towed," Loera explained as the cops rigged the food truck to the tow truck. They gave Paty's truck a $55 summons saying it was not allowed to sell merchandise from a metered spot, Loera said. His mother, Patricia Monroy, who does not speak English, made the ultimate decision to stay put once her family translated what the cops were saying. "My mother felt like she was not breaking the law," Loera said. "We still had 45 minutes on the meter." Roughly eight officers in a police van had been monitoring Paty's the entire morning, said Sean Basinski, director of the Street Vendor Project, an advocacy group based at the Urban Justice Center. Loera had reached out to the Street Vendor Project after his Nov. 30 arrest, and members of the organization joined Paty's for Tuesday's return to raise awareness on issues vendors face: harassment from law enforcement and city offices, a harsh ticketing system and excessive punishment and regulations confusing to vendors and cops alike. But no one anticipated the towing. "Even if they were breaking parking rules — and I don't think they were because I don't think food is merchandise — that's why they get a ticket. But that's not a worth a tow," Basinski said. Police did not respond to DNAinfo's request for comment. The food truck was careful to follow parking rules, Loera said. It arrived on the Upper East Side about 10:15 a.m., changing spots about 11 a.m. and again an hour later. Loera and his mother, who was tearing as the truck was being towed, hopped in a cab to follow it. They did not want a repeat of the last towing, when all of their perishables and other items — including its generator — had been removed from the truck, Loera said. After they paid the $370 to get their truck back in November, they had to take out a $5,000 loan so they could restart the business that provides the livelihood for six families, Loera said. They decided to leave the truck at the tow pound Tuesday night and go to court Wednesday to protest the ticket and get another $370 fee waived. Paty's had faced the ire of several residents on Community Board 8, who complain about food trucks in the area. They worry the trucks are illegally hogging metered parking spots and that they are unfairly competing with struggling brick-and-mortar stores. But Loera had been determined to come back to where he built a loyal following in more than two years in the neigborhood. Many in the neighborhood were delighted last week when Paty's had its soft opening in the evenings before heading down to Union Square where it feeds a late night crowd. "Their veggie tacos are really good," said Barkha More, an accountant who lives a block away and gets her dinner at Paty's at least once a week. "I was going to go down to Union Square to get them." The Street Vendor Project hoped to spend the day with Paty's rallying for the passage of two City Council bills that would lower the maximum ticket fine from $1,000 to its previous cap of $250 and would redefine violations — so unrelated violations would count as separate offenses — to make the ticketing process fairer. An Independent Budget Office report had found that street vendors are hampered by a "complexity of regulations," which led to $14.9 million in outstanding fines.